The Park Avenue Viaduct, also known as the Pershing Square Viaduct, is a roadway in Manhattan, New York City. It carries Park Avenue from East 40th to 46th Streets around Grand Central Terminal and the MetLife Building, then through the Helmsley Building; all three buildings lie across the line of the avenue. The viaduct was listed on the National Register of Historic Places in 1983, technically as a "boundary increase" to the Grand Central Terminal's listing, but carrying a separate reference number. The viaduct provides a pedestrian-, bicycle-, and bus-free express route for taxicabs and other automobile traffic from 40th Street to 46th Street. From the south, traffic from Park Avenue or the Park Avenue Tunnel enters a ramp which rises to a T-intersection above 42nd Street, over the street-level entrance to Grand Central Terminal below. A statue of Cornelius Vanderbilt, longtime owner of New York Central, is at the T-intersection where the two legs of the Park Avenue Viaduct split. The elevated roadway then passes in front of Grand Central Terminal and around it to the east, passing the MetLife Building and descending again to ground level through the east portal in the Helmsley Building, arriving at 46th Street. Southbound traffic reverses this pattern: up a ramp through the Helmsley Building's west portal, past the MetLife Building, around the west side of Grand Central, and then to the right and down again to 40th Street, where the viaduct connects to Park Avenue. The street-level service roads of Park Avenue between 40th and 42nd Streets are called Pershing Square. The section between 41st and 42nd Streets is open only to bikes and pedestrians. The square is named after General John J. Pershing. Consequently, the portion of the viaduct between 42nd and 40th Streets is also known as the Pershing Square Viaduct. The arches of the Pershing Square Viaduct over 42nd and 41st Streets are based on the Pont Alexandre III in Paris. :83 Two ramps, northbound and southbound, run along street level, flanking the viaduct on either side. The viaduct was first proposed by New York Central Railroad president William J. Wilgus in 1900 as part of the construction of Grand Central Terminal. :60–62 During a design competition in 1903, Reed and Stem, experienced railway-station designers, proposed vehicular viaducts around the terminal. New York Central ultimately selected Reed and Stem, as well as Warren and Wetmore, to construct Grand Central Terminal. :53 :118–120 However, the two architectural firms had a tense relationship. Over Wilgus' objections, Warren and Wetmore removed a proposed 12-story tower as well as vehicular viaducts that had been part of Reed and Stem's plan. :123 The elevated viaducts were restored, as were several of Reed and Stem's other design elements, as part of an agreement between the two firms in 1909. Construction on the viaduct began in 1917, after the terminal had opened. Work progressed rapidly despite the difficulty in securing labor and material during World War I, and the viaduct opened on April 16, 1919. The original viaduct took two way traffic from Park Avenue at 40th Street and carried it around the west side of Grand Central Terminal, depositing it at the corner of Forty-Fifth Street and Vanderbilt Avenue. A spur ran east along the rear of the terminal, providing parking space and an entrance to the Commodore Hotel. Shortly after the viaduct's opening, plans started to formulate for a public square at the bottom of the viaduct, which would be called Pershing Square in honor of General Pershing. In 1920, some of the land that had been intended to be Pershing Square was sold to a real estate development company, which put up an office building called the Pershing Square Building, completed in 1923. The service roads of the Park Avenue Viaduct would later become Pershing Square. Additional measures were needed to prevent a traffic tie up at the north end of the newly completed pass. New York Central engineers suggested a plan that proposed that Park Avenue be closed to all vehicular traffic at the 45th Street grade, and that traffic be carried around both sides of the terminal and deposited at Park Avenue and 46th Street. A contract to build the northbound leg of the viaduct around the terminal's east side was certified in December 1925. The plan was approved by the Board of Estimate in January 1928, and construction was complete by September of that year. An $8 million restoration of the viaduct was announced in 1989. The viaduct's original lamps, removed in a 1986 repaving of the viaduct, were restored in 1992. In 1939, the city built a steel and glass-brick structure under the viaduct at the center of Pershing Square from 42nd Street to 41st Street, which it used to provide tourist information. The building, at 90 East 42nd Street, was later converted into a restaurant. In 1995, the city and the Grand Central Partnership unveiled plans to restore the restaurant space at a cost of $2 million, then lease it as a restaurant. A cafe signed a lease at the space in 1997. As of 2014, the restaurant under the viaduct is called the Pershing Square Cafe. Will Smith, as a policeman, pursues a criminal by jumping off the viaduct in the 1997 film Men in Black. In the 2007 film I Am Legend, Will Smith's character is captured by a vampire's snare there. The viaduct is also shown during a battle in the 2012 film The Avengers. Michael Keaton flies through the viaduct in 2014's Birdman. ^ Durante, Dianne L. (2007). Outdoor Monuments of Manhattan: A Historical Guide. NYU Press. Retrieved December 19, 2018. ^ Warerkar, Tanay (February 16, 2018). "Busy block near Grand Central Terminal will transform into a pedestrian plaza". Curbed NY. Retrieved December 5, 2018. ^ a b Robins, A.W. ; New York Transit Museum (2013). Grand Central Terminal: 100 Years of a New York Landmark. ABRAMS. ISBN 978-1-61312-387-4. Retrieved December 6, 2018. ^ a b c Schlichting, Kurt C. (2001). Grand Central Terminal: Railroads, Architecture and Engineering in New York. Baltimore: Johns Hopkins University Press. ISBN 0-8018-6510-7. ^ a b "Grand Central Terminal Interior" (PDF). Landmarks Preservation Commission. September 23, 1980. p. 5. ^ "NEW FORTY-SECOND STREET VIADUCT; Work Started on Structure to Connect Park Avenue with Grand Central Terminal. WILL RELIEVE CONGESTION The City to Pay $587,000 as Its Share of the Cost of the Improvement". The New York Times. November 4, 1917. Retrieved December 7, 2018. ^ a b c d "New Viaduct Thoroughfare Relieves Park Avenue Traffic Congestion; Result of Many Years' Work" (PDF). The New York Times. September 2, 1928. p. Real Estate, Page 123,. Retrieved December 7, 2018. ^ "PARK AV. ROADWAY PLAN GOES THROUGH; Craig Certifies Contract for Great Improvement Around Grand Central Terminal. LAST OBSTACLE REMOVED To Extend Vanderbilt Avenue, Utilize Depew Place and Widen Park Avenue Roadway. PARK AV. TRAFFIC PLAN GOES THROUGH". The New York Times. December 29, 1925. Retrieved December 26, 2018. ^ Gray, Christopher (October 29, 1989). "STREETSCAPES: The Grand Central Viaduct; An $8 Million Revival for a Midtown Masterpiece". The New York Times. Retrieved December 24, 2018. ^ Louie, Elaine (October 8, 1992). "CURRENTS; 1919 Lights Return to A Viaduct". The New York Times. Retrieved December 25, 2018. ^ Martin, Douglas (November 16, 1995). "Plan for Pershing Square Would Yield New Park". The New York Times. Retrieved December 25, 2018. ^ Rothstein, Mervyn (May 14, 1997). "Restaurant to Fill Niche Under Park Ave. Viaduct". The New York Times. Retrieved December 25, 2018. The 110th Street station was a station located on the Metro-North Railroad's Park Avenue Viaduct in East Harlem, Manhattan, New York City. The station was built by the New York Central & Hudson River Railroad as part of an agreement with the New York City government. The P-12-42, also known as the Speed Merchant, was a streamlined, 1,200 hp (890 kW) locomotive built between 1957–1958 by Fairbanks-Morse, specifically to operate on each end of the Talgo train produced by American Car and Foundry. This model represented F-M's attempted entry into the lightweight locomotive market, but only four of the low-slung units were produced: the first pair was purchased by the New York, New Haven and Hartford Railroad for their John Quincy Adams train (New York, New York to Boston, Massachusetts), while the second pair went to the Boston and Maine Railroad for their Speed Merchant train (Boston, Massachusetts to Portland, Maine). The P-12-42's eight-cylinder opposed piston engine was rated at 1,600 horsepower (1,200 kW) after 1950, but train lighting and other ancillary loads ("hotel" power) used about 25% of output, leaving 1,200 horsepower (890 kW) for traction. The 100-ton units measured 60 ft 0 in (18.29 m) long by 10 ft 6 in (3.20 m) wide by 12 ft 0 in (3.66 m) high, and were configured in a B-2 wheel arrangement mounted atop a pair of two-axle AAR road trucks, geared for 117 mph (188 km/h) with only the first two axles powered. The P-12-42 was one of the first locomotives to have its prime mover configured to run at a constant speed, with traction generator output regulated solely by excitation. F-M expected to sell many more units to the New Haven, and to spin the technological advance off into a line of passenger units, including a proposal that used a Train Master-style carbody, but with financial troubles preventing F-M from extending financing to customers, the cash-strapped New Haven ultimately opted to purchase a fleet of sixty EMD FL9s instead, as GM financing was available for the purchase. The New Haven's Talgo train was sold to Ferrocarril de Langreo for service in Spain, in 1962, and their locomotives sat unused afterwards, until being scrapped in 1971. The Boston and Maine's train remained in service until 1964. Grand Central was the terminal for some trains of the IRT Third Avenue Line, also known as the Third Avenue El. This station had two tracks and one island platform and two side platforms, all connected at the west end. The tracks ended just east of the Park Avenue Viaduct ramp over Pershing Square.It opened August 26, 1878, and served not only Grand Central Terminal but also its two predecessors, Grand Central Station (1899-1913) and Grand Central Depot (1871-1899). When the El opened north of 42nd Street in September 1878, this segment was reduced to a shuttle, which connected to the mainline at the 42nd Street station, at Third Avenue. In 1904, the Interborough Rapid Transit Company opened the Grand Central station as part of the its first subway line. Platforms for the IRT Flushing Line opened in 1915, followed by those for the IRT Lexington Avenue Line in 1918; after the Lexington Avenue Line platforms opened, the original platforms at the station were converted for use by the 42nd Street Shuttle. By this time, the El station had become obsolete and it was closed on December 6, 1923. The Helmsley Building is a 35-story building located at 230 Park Avenue between East 45th and East 46th Streets in Midtown Manhattan, New York City, which was built in 1929 as the New York Central Building, and was designed by Warren & Wetmore, the architects of Grand Central Terminal, in the Beaux-Arts style. Before the completion of the Pan Am Building—now the MetLife Building—this building stood out over the city's second most prestigious avenue as the tallest structure in the great "Terminal City" complex around Grand Central.Traffic exits and enters the Park Avenue Viaduct through the building, through two portals, one for uptown traffic and one for downtown. They connect to Park Avenue proper at East 46th Street. The building was designated a New York City Landmark in 1987. Julius Miller (January 12, 1880 – February 3, 1955) was a Manhattan Borough President from 1922 to 1930, who is best remembered for pushing through the West Side Elevated Highway from 72nd Street to the tip of Manhattan. There are over 6,000 properties and districts listed on the National Register of Historic Places in New York State. Some are listed within each one of the 62 counties in New York State. Of these, 258 are further designated as National Historic Landmarks. The Park Avenue Tunnel, also called the Murray Hill Tunnel, is a 1,600-foot-long (488 m) tunnel that passes under seven blocks of Park Avenue in Murray Hill, in the New York City borough of Manhattan. Traffic currently goes northbound from 33rd Street toward the Park Avenue Viaduct. The tunnel is under the jurisdiction of the New York City Department of Transportation, and carries one lane of northbound car traffic from East 33rd Street to East 40th Street; from 40th Street north, traffic must follow the Park Avenue Viaduct around Grand Central Terminal to 46th Street. The vertical clearance is 8 ft 11 in (2.72 m). The IRT Lexington Avenue Line of the New York City Subway runs parallel to the Park Avenue Tunnel in two tunnels below it. The Park Avenue main line, which consists of the Park Avenue Tunnel and the Park Avenue Viaduct, is a railroad line in the New York City borough of Manhattan, running entirely along Park Avenue. It carries four tracks of the Metro-North Railroad underground from Grand Central Terminal at 42nd Street to a portal at 97th Street and via a full viaduct north of 99th Street and continues over the Harlem River into the Bronx over the Park Avenue Bridge. During rush hours, Metro-North uses three of the four tracks in the peak direction.Originally constructed in the mid-19th century as a New York and Harlem Railroad route, the Park Avenue main line was initially a street railroad and ran to what is now Lower Manhattan. It was gradually truncated through the 1860s, until Grand Central Depot was opened at 42nd Street in 1871. The line was placed in a grade-separated structure in the late 19th century as part of the Fourth Avenue and Park Avenue Improvement projects, and was electrified in the first decade of the 20th century as part of the construction of Grand Central Terminal. Since then, several minor improvement projects have been made along the main line. Pershing Square is a public square in Manhattan, New York City, located where Park Avenue and 42nd Street intersect in front of Grand Central Terminal. The main roadway of Park Avenue crosses over 42nd Street on the Park Avenue Viaduct, also known as the Pershing Square Viaduct. Two service roads, one northbound and one southbound, formerly connected 42nd Street with the main roadway of Park Avenue, at 40th Street. The service roads between 42nd and 41st Streets were converted into a pedestrian public plaza in 2018.The square is named after General John J. Pershing, and was originally intended to be an open plaza in Pershing's honor occupying the entire block between 42nd and 41st Streets and Park and Lexington Avenues; plans for this were first circulated in 1919. In 1920, some of the land that had been intended to be Pershing Square was sold to a real estate development company, which put up an office building called the Pershing Square Building, completed in 1923. As a result, "Pershing Square" now refers to the area immediately under and around the viaduct.In 1939, the city built a steel and glass-brick structure under the viaduct at the south end of Pershing Square from 42nd Street to 41st Street, which it utilized to provide tourist information. The building, at 90 East 42nd Street, was later converted into a restaurant, which, as of 2015, is called the Pershing Square Cafe. Grand Central Terminal is a major commuter rail terminal in Midtown Manhattan, New York City, serving the Metro-North Railroad's Harlem, Hudson and New Haven Lines. It is the most recent of three functionally similar buildings on the same site. The current structure was built by and named for the New York Central Railroad, though it also served New York Central's successors as well as the New York, New Haven and Hartford Railroad. 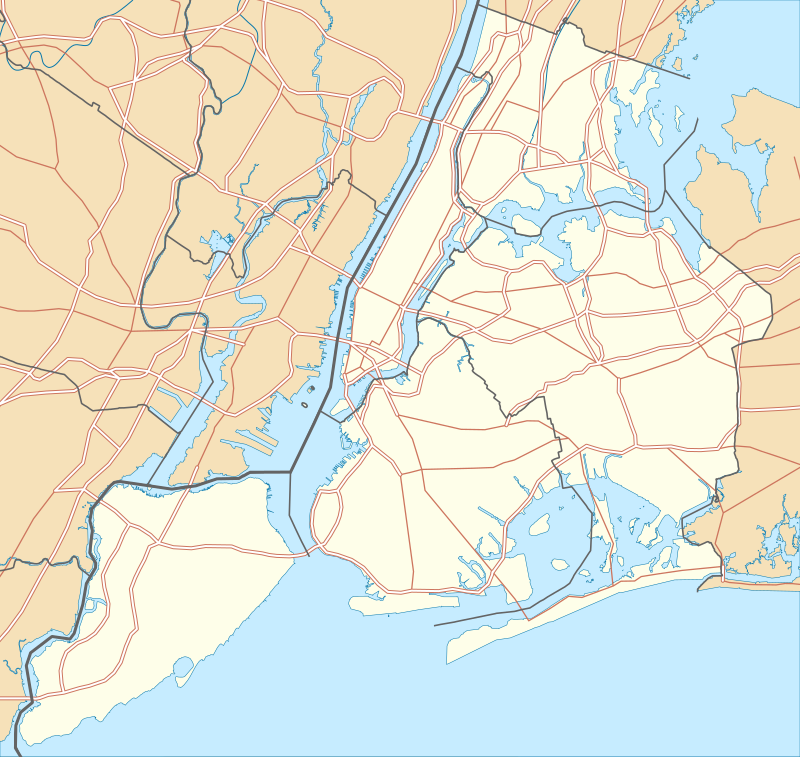 Vanderbilt Avenue is the name of three thoroughfares in the New York City boroughs of Brooklyn, Manhattan, and Staten Island. They were named after Cornelius Vanderbilt (1794–1877), the builder of Grand Central Terminal in Midtown Manhattan. Colonel Walter Katte (November 14, 1830 – March 4, 1917) was a British-born American civil engineer. Katte led design and construction of Eads Bridge at St. Louis, Park Avenue Viaduct, and construction of the Weehawken Tunnel in New Jersey, was Chief Engineer of the New York Central Railroad company, founding member of Western Society of Engineers and one of early members and director of the American Society of Civil Engineers. Katte was also responsible for construction of railroad stations on Harlem Line: Melrose, Morrisania, Tremont and Fordham station. Katte was a Colonel of Engineers in the Union Army during the Civil War. The New York Times called Katte a "famous engineer".